Using Blogger or Wordpress For Making Money Online? masnasih.com - Blogger and wordpress are the same. These two platforms share their own advantages and disadvantages. 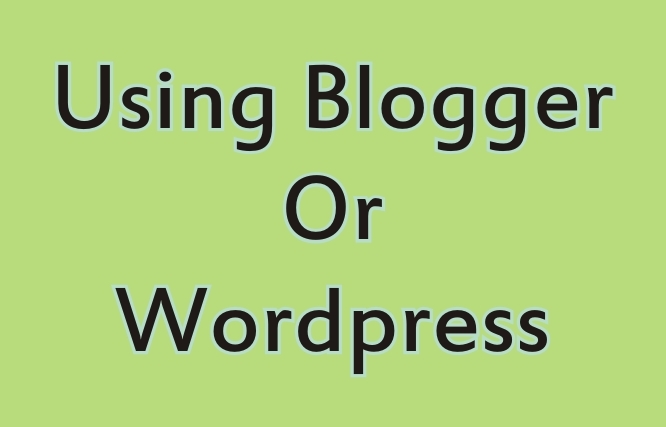 So to choose between blogger and wordpress we need to do further analysis. Let's do a deeper analysis to get the best results. If our goal is to create an online store, wordpress is the right choice. WordPress has many advantages, including having a plugin feature that makes it easy for us to add cart menus and all things related to online stores. Blogger does not have plugin features like wordpress. Blogger is suitable for product promotion that goes directly to whatsapp chat, or sms to our phone number. Blogger is also suitable for monetizing google adsense. Without complicated blog settings, blogger is very easy to use and just use it. Using wordpress means we need the ability to optimize a website so that it can be accessed quickly. We have to use the right hosting, hosting with unlimited storage and unlimited bandwidth. Incorrect choice of hosting will make our website slow and even inaccessible. But good hosting is of course expensive. Using blogger, unlimited bandwidth and unlimited storage. We don't need to worry about website speed optimization and also don't need to worry about hosting upgrades. We only need to use a friendly template. We can download it on the websites of blogger template providers without having to pay. Using wordpress we can upload any file that forms the file including document files, exel, powerpoint, etc. But of course we have to adjust the hosting capacity that we rent. If we rent cheap hosting, then of course uploading files must pay attention to the storage capacity. If the hosting we rent has unlimited storage, of course it's not a problem. With blogger we cannot upload files like wordpress. Blogger only provides storage of images and videos. In addition to videos and images, we must accept from third party sites. For example, when we want to upload a power point file, then we can upload it on Google Drive, then upload it on our website. Yes. Maybe that's the analysis that can be used to choose between wordpress and blogger. I think after you read this article you can conclude for yourself, whether you will use wordpress or blogger.